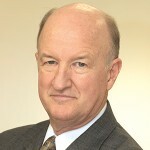 Mark Skousen is an American economist, investment analyst, newsletter editor, college professor and author of more than 25 non-fiction books. AR: Professor Skousen… Thank you for this opportunity to let us know a little more about yourself. Please, explain the context in which you grew up in Portland, Oregon. Yes, I grew up in Portland, a great intellectual environment (Reed College, a hotbed of radical thinking, was nearby). It forced me to always be informed and ready to defend my beliefs in economics, politics and religion. My two older brothers, Royal and Joel, as well as my high school friends, constantly challenged me to debate and learn new things. AR: I have read that your father was an FBI agent. Is this a key to understand why you have been interested in economics and politics since such a young age? Primarily politics. Like my better-known uncle, W. Cleon Skousen, my father was an FBI agent and a lawyer involved in the anti-Communist movement and gave speeches through the Northwest on politics and the communist threat. We subscribed to publications such as “National Review” and “The Freeman” and attended events and anti-communist rallies. AR: Was your father a libertarian? Did he introduce you to the Austrian tradition of ideas? Economics did not become a topic of focus until I took a class in the subject in my senior year in high school. It was taught so badly that I knew I could do better and suddenly I could think of little else. My interests have always been eclectic, and economics interested me intensely because it covers my other interests in mathematics, history, finance, politics and writing. My interest was so intense that I got a B. A., M. S., and Ph.D., all in economics. AR: Some authors do not like to be called “Austrian”, “Monetarist”, “Keynesian” or “Marxist”. Are we right if we say that you are an Austrian Economist? I used to be of the opinion that we should all be simply “good economists” as Milton Friedman and Lionel Robbins preached, and not compartmentalize ourselves into various schools. If economics is an objective science, we shouldn’t divide ourselves in various camps, or even “left“ or “right,” terms that create more heat than light. We should all be searching for the truth, no matter what the source. Nevertheless, over time I’ve come to appreciate the biases and advantages of each school. Monetarists focus on the importance of money and the competitive marketplace; Keynesians on consumption, government spending, and institutions; Marxists on labor and management relations; and Austrians on capital and the structure of production. One can learn a great deal by studying the focal points of various schools that otherwise would be missed. But of all the schools, I’ve always found Austrian school to be the most rewarding. AR: You have been working in the Austrian tradition for a long time, writing books and articles, teaching and giving conferences everywhere. You have even organized FreedomFest. Why? What have you found in this tradition that was absent in other schools of thought? My first introduction to economics in college was through the popular Keynesian textbook written by Paul Samuelson, and his defense of deficit spending, the welfare state, and his anti-saving mentality (“paradox of thrift”) was a turnoff, contradicting everything I had been taught as a social conservative Mormon, and so I was immediately looking for alternative models. I was first attracted to writings of Milton Friedman, having been introduced to the Chicago school by Professor Larry Wimmer at Brigham Young University (my alma mater) in the 1960s. Wimmer got his Ph. D. under Friedman. I was especially interested in “Capitalism and Freedom.” While I found Friedman’s writings refreshing and convincing, he could not answer all my questions and doubts about Keynesian macroeconomics and the business cycle. The Austrians definitely have the upper hand when it comes to discussions of money and banking, the business cycle, the structure of production, and how the economy works. I found their macroeconomics far more sophisticated and satisfying than the standard Keynesian and Monetarist models. However, I should add that since the Seventies, I have regained a great deal of respect for the Chicago tradition, especially their approach of looking at the data and testing various theories in micro and macro economics. Today I consider myself having one foot in the Austrian school and one foot in the Chicago school. But if I lean toward any one school, it is Austrian. AR: You have received your Ph.D. in Economics and Monetary History from the George Washington University. How was that experience? What have you learned from mainstream economics? It was a traditional mainstream Ph.D. program, although it did not emphasize advanced mathematics as much as other schools at the time. The professors focused more on theory, history and statistics than mathematical modeling, which I found attractive. I learned a great deal from John W. Kendrick, Arthur E. Burns, and Robert Grossfarb, among others. They gave me plenty of leeway, and in fact, they let me chose as my dissertation “The Economics of a Pure Gold Standard,” which was heavily Rothbardian — and it sailed through with few changes. I believe I’m the only economist to write a “no compromise” Ph.D. dissertation on the 100% gold standard. At the end of my dissertation committee oral, I was asked, “You don’t really believe in a pure gold standard, do you?” Not surprisingly, Rothbard always loved my dissertation, which has been published and gone through four editions so far (published currently by the Foundation for Economic Education). AR: And what was your contribution in that dissertation? It was a history of economic thought about the pure gold standard, as well as a discussion of a silver standard, and its role in society. I tried to show there were strong economic arguments for gold, that monetary gold increased at a rate similar to the monetary rule and that a commodity-based system was not a burden. I was surprised to read that even Mises and Hayek rejected the economic arguments for gold, and only favored gold for political reasons. I also did a comparative study between the gold standard, a monetary rule, free banking, and the current model of central banking under fiat money, pointing out the pros and cons of each. Ultimately, I came to the conclusion that the search for a monetary nirvana, an ideal or perfect monetary system, remains elusive. Each monetary program has its pluses and minuses. Economists have solved so many problems, but the ideal monetary system has eluded us. On a purely theoretical level, the international gold standard is probably the best of the lot. On a practical level at this point, the best we can hope for is a monetary system that minimizes structural imbalances, and I think it must include gold in some way as a monitoring device and discipline. AR: You have been connected with most of the great Austrian economists such as Friedrich Hayek or Murray Rothbard. Any experience you would like to share with us? I knew both of them. I met Hayek two or three times, and was one of the last people to interview him. In 1985, Gary North and I spent three hours with Hayek at his summer home in the Austrian Alps and peppered him with questions about philosophy, history of the early Austrian school in Vienna, and economics. Much of the interview showed up in “Hayek on Hayek,” in the collected works of Hayek (without attribution, strangely enough). Hayek was in delicate health, but loved every minute of the interview. Afterwards, his wife yelled at us for taking so much of his time. “He won’t be able to do any work for weeks! Get out!” she shouted as she shooed us out the door. I spent more time with Rothbard in New York, and at conferences sponsored by the Mises Institute, back in the 1980s and early 1990s. He was one of those people who could talk for hours on any subject. It’s like you could never reach the depth of his knowledge. Around 1980, I commissioned and paid him a handsome sum to write an alternative popular history to Robert Heilbroner’s “Worldly Philosophers.” Heilbroner had an unforgettable title, but his favorite economists were Marx, Keynes and Veblen. We deserved better, so I asked Murray to write the definitive history from an Austrian perspective. He was supposed to write around 12 chapters in 1-2 years, starting with Adam Smith. It turned out to be a much bigger project, a Schumpeterian tome, beginning with the Greeks. I kept encouraging him, but ultimately gave up. The running joke was “Are you to Marx yet?” Adam Smith was supposed to be the subject of chapter 1. Instead it was chapter 16. He finally got to Marx, but then suddenly died of a heart attack in 1995, and the publisher Edward Elgar published two volumes posthumously. Murray planned on writing two more volumes in his exhaustive history, but sadly never got to them. A few years later, I decided to write the one-volume Heilbroner alternative myself, calling it “The Making of Modern Economics” (ME Sharpe, 2001). AR: “The Structure of Production” (New York University Press, 1990) was your first academic book, and sometimes is described as a classic of modern Austrian macroeconomics. What can the reader find in that book? “Structure of Production” has been viewed an the underground bible of supply-side economics; a revival of Say’s law; a tool for financial analysis; and most importantly, as an Austrian advance over the standard Keynesian and monetarist Weltanschauung. I firmly believe that during our short sojourn in life, we should concentrate on advancing and improving upon the works of others. Why spend time in an activity that others are already carrying on satisfactorily? I saw a need to improve upon Hayek’s masterful macroeconomic model found in “Prices and Production” (1931). The Austrians needed an up-to-date macro model that countered the Keynesian and Monetary models in vogue today. I thought that Hayek’s triangles were a good starting place, but they were entirely theoretical, which was one reason it didn’t catch on. In my work, “The Structure of Production” (NYU Press, 1990), I attempted to modernize Hayek’s triangles into a universal four-stage model of the economy (resources, production, distribution, and final output) that could be integrated into national income statistics and could be tested empirically. In addition to the universal four-stage model of the economy, the book introduces a new aggregate statistic, Gross Domestic Expenditures (GDE), which attempts to measure total spending in the economy. I show that GDE can easily be integrated into textbook national income statistics such as GDP. 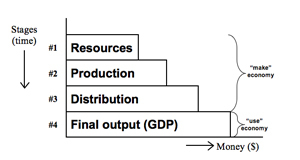 See below for the diagram 4-stage model of the economy, and the relationship between GDE and GDP. I also seek to advance the Austrian theory of the business cycle with my introduction of Aggregate Demand Vectors (ADV) and Aggregate Supply Vectors (ASV). It took me nearly 10 years to write the book, and it’s only now getting some recognition. New York University Press recently released a paperback edition, with a new introduction (2007). I see it was recently translated into Polish. AR: If I am not wrong, Rothbard had read that book. Did he give you any comments? What does he thinks about so many graphs? Murray read the entire manuscript and offered numerous suggestions. I think he recognized the breakthrough nature of my work as an Austrian advance in macroeconomics. He has some doubts about my use of graphs, but ultimately endorsed the book, and it was carried for many years by the Mises Institute. I firmly believe that if we don’t encourage graphics and statistical work in Austrian economics, we will never get accepted by the mainstream textbook community. I wrote my textbook “Economic Logic” in order to demonstrate how it could be done without sacrificing theoretical purity. I was amazed that it could be done. And yes, there are lots of graphs and statistics in my textbook. I remember the story Larry Wimmer told me. In the 1960s he attended a FEE seminar in New York, and when he tried to draw a supply and demand curve on the blackboard, he was severely reprimanded by the hard-core Misesians. I hope we’ve gotten beyond that kind of Misesian Puritanism. (As far as I’m aware, Mises drew only one graph in all his books, one in “Socialism”). AR: What do you think about Capital Based Macroeconomics developed in “Time and Money” by Roger W. Garrison? Professor Garrison is a creative genius and his book offers a significant advancement in Austrian macroeconomics. He has lots of graphs! I especially like the way he integrates and contrasts the Austrian triangles with the Keynesian cross. Absolutely brilliant. I’ve used his book in my classes at Columbia University. AR: Why do you think that most of the mainstream economists do not pay attention to the Austrian Theory of Capital and the Austrian Theory of Business Cycles? They are still caught up in Keynes’s law (demand-side management) rather than Say’s law (supply-side management). Until the most recent financial crisis (2008), the mainstream macro models were deemed sufficient to explain the business cycle. For Keynesians, it was the deficiency in either aggregate demand (like the Great Depression) or aggregate supply (as in the case of the Stagflation of the 1970s); for the Monetarists, it was monetary disequilibrium (tight money in the Great Depression or easy money in the 1970s). Both the Keynesian and Monetary models downplayed the impact of asset bubbles because when these asset bubbles collapsed, they only had a micro effect on the economy. So for years, the Austrian model of structural imbalances was ignored. Then along came the real estate bubble and collapse in the most recent financial crisis, and for the first time, economists had to pay attention to the macro effects of an asset bubble (real estate and mortgage securitization) that collapsed and impacted the entire monetary system. So now the profession cannot ignore asset bubbles any longer, and the Austrian theory of the business cycle can no longer be ignored. The Austrian theory is the only macro model that focuses on the structural imbalances created by below-natural interest rates and easy money, so I expect more and more economists will pay attention to it. AR: Am I wrong if I say that even today most of the Austrian Economists still do not understand the meaning and the complexity of the structure of production? Austrian macroeconomics is a sophisticated theory that has challenged even the best economists. Most economists desire simple, predictable models, and that’s difficult to achieve in the Austrian model with various stages of production and consumption, the structure of interest rates, and changes in savings rates, monetary policy, and technological development. I discuss a variety of scenarios using the Austrian model in “The Structure of Production” (see chapters 7-9). I must admit I was shocked and disappointed that an Austrian economist of such stature as Walter Block would question the value of Hayek’s triangles in a recent article. It’s bad enough that Friedman and the Chicago school consider Hayek’s capital theory “obtuse and confusing,” but for Austrian economists to question it is a sad commentary on the state of Austrian economics today. Hopefully, these criticisms won’t undermine the good work that Roger Garrison and others have done to advance Hayek’s macroeconomics. AR: Your second academic book was “Economics on Trial” (Irwin McGraw Hill, 1991). What was your contribution there? What were the lies, myths and realities? Here again I tried to do something new, i.e., review the top ten textbooks in economics at the time, including Samuelson’s “Economics,” and categorize their sins of omission and commission. I noted how they were all pretty much Keynesian in their approach, using Aggregate Supply and Demand, perfect competition, etc. They were largely anti-saving, pro-progressive taxation, and pro-government/welfare state in their macroeconomics. The latter statement came out right before the Berlin Wall collapsed and was especially embarrassing to the Nobel Prize winning economist Paul Samuelson. But my book isn’t entirely about sins of commission. I urged the profession to focus more on savings and economic growth (using the Asian boom as a good example) rather than the business cycle and distribution of wealth and income, and that it should look to the “next economics,” one that focuses on capital and growth — i.e., the Austrian model of Mises, Hayek, and Schumpeter. I also championed the return of Say’s law, with its emphasis on saving, investment, productivity, entrepreneurship and other aspects of the supply side as the keys to economic growth and higher living standards. I’ve received a number of letters from readers suggesting I update “Economics on Trial.” I do think the profession has made some improvements, especially by focusing on the classical model more than the Keynesian model in the most recent textbooks (Mankiw’s textbook leads the way in this respect), but it still needs to replace the defective AS-AD in macro and the perfect competition model in micro. I’ve replaced both with better Austrian-style models in “Economic Logic,” and I encourage economists of all stripes to look at my new approach in pedagogy. AR: Some of your books deal with the History of Economic Thought. If you have to make a list of the five most important books that have influence your own thinking on the field, what would they be? The reason I commissioned Murray Rothbard to write a contra-Heilbroner history was out of frustration with all previous histories of thought. They were all written by either Keynesians, Marxists or socialists. One exceptional work was “The Enterprising Americans,” by John Chamberlain, an economic journalist, but it was far from complete. In writing my on one-volume history, I benefited significantly from several recent “tell all” biographies on John Stuart Mill, Karl Marx, Alfred Marshall, Thorstein Veblen, Max Weber, Joseph Schumpeter, John Maynard Keynes, Ludwig von Mises, Friedrich Hayek, and Milton Friedman, among others. I also like Albert Hirschman’s “The Passions and the Interests” and Mark Blaug’s “Not Only an Economist,” and his two volume work “Great Economists Before Keynes” and “Great Economists After Keynes.” Blaug is the foremost historian of economic thought, and he has recently said some positive things about the Austrians. Of course, I found Rothbard’s two volume history of economics useful. Another helpful textbook is Ekelund’s and Hebert’s “History of Economic Theory and Method” (1990) — a graduate level text that is comprehensive, fair and balanced. AR: Let me jump for a moment to your “The Making of Modern Economics” (M. E. Sharpe Publishers, 2001, 2009). Let´s start with your first chapter. Is it correct to conclude that “All started with Adam” Smith? What about Cantillon or Turgot? Obviously, there were “pre-Adamites,” as I call them. But Adam Smith’s “Wealth of Nations” was the first real “fat” book that attempted to bring together the full body of theory and history of economic life, far more than any theoretical treatises of Cantillon, Turgot, or even Aristotle, Thomas Aquinas, and the Spanish scholastics. In many ways, Smith’s two-volume tome was the beginning of modern political economy. As George Stigler said, “You can find it all in Adam Smith.” Well, not quite, but it was the start of something big. AR: By the way, what do you think of Rothbard´s criticism to Adam Smith? Who was right, Rothbard or Mises? There was only one way to find out. I decided to read the entire 1,000-page “Wealth of Nations,” page by page and cover to cover, and come to my own conclusion. Two months later, I put the book down and said to myself: “Murray Rothbard is wrong and Mises is right.” Adam Smith has written a grand defense of the invisible hand and economic liberalism. My change of heart completely transformed my history. Suddenly, “The Making of Modern Economics” had a plot, an heroic figure, and a bold storyline. Adam Smith and his system of natural liberty became the focal point from which all economists could be judged, either adding to or distracting from his system of natural liberty. After coming under attrack by socialists, Marxists and Keynesians, the invisible-hand model of Adam Smith was often left for dead but revived from time to time and revised and improved upon by the French, Austrian, British, and Chicago schools, and ultimately triumphed with the collapse of the socialist central planning model in the early 1990s (although it is again being tested by the ongoing financial crisis). Granted, Smith made numerous mistakes in his classic work, such as his crude labor theory of value, his attack on landlords, and his failure to recognize marginal subjective values, but French, British, Austrian and Chicago economists have done a great job improving upon the House that Adam Smith Built without destroying his fundamental system of natural liberty, and his policy prescriptions, which were largely libertarian (the classical model of limited government, free trade, balanced budgets, and sound money). of social democrat. Both are wrong. Mises had the right attitude when it came to Adam Smith. Smith established the “keystone” of the market economy. By the way, “The Making of Modern Economics” has been my most successful academic book, having been translated into five languages, including most recently a fine Spanish volume published by Union Editorial through the good support of Professor Jesus Huerta de Soto. It also won the Choice Book Award for Outstanding Academic Title in 2009. Choice is the official organ of the academic libraries in the United States. It has been adopted by dozens of history of thought classes around the United States and the world. Roger Garrison uses it at Auburn, and he tells me that the students love it. I do hope your readers will check it out either the English or Spanish edition. AR: What do you mean saying that “Marx madness plunges economics into a New Dark Age”? Can we see in the future a revival of Socialism? That’s my famous chapter 6 in “The Making of Modern Economics.” Marxism-Leninism has done so much harm in the world that I wanted my views unmistakably clear about Marxist doctrine and policies. This chapter has been translated into many languages and has converted many Marxists around the world into free-market advocates. The latest edition has a section of “liberation theology” that has been so popular in Latin America. AR: In “The Big Three in Economics” (M. E. Sharpe, 2007) you talk about Adam Smith, Karl Marx and John Maynard Keynes. Was Keynes the saver of capitalism? During the 1930s and the Great Depression, Marxism was all the rage on campuses, threatening to undermine democracies around the world. Students, academics and government officials were searching for a more moderate alternative, and rejecting laissez faire, they discovered in Keynes a “middle of the road” alternative in big government and the welfare state. If Keynes hadn’t come along, the West might have fallen into a Marxist state. Now our challenge is to dig out of the pit that Keynes has put us into. In “The Big Three,” I came up with the idea of the totem pole of economics, ranking economists from top to bottom, rather than the pendulum approach, where economists are linked to the left, middle and right. As Ronald Reagan once said, “There’s no left or right, only up or down.” Of the big three, I rank Adam Smith on top, Keynes below him, and Marx is low man on the totem pole. I commissioned a Florida woodcarver to create the Totem Pole of Economics, which I display in my home. AR: Are we living today a Return of the Master? AR: Let´s talk about “Vienna and Chicago: Friends or Foes?” (Capital Press, 2005). What do you think are the four areas where both schools dissent? You mean dissent from each other? My book looks primarily at their major differences in methodology, monetary policy, the business cycle, and antitrust. But they also agree on many points. Both the Austrian and Chicago schools see no value in heavy deficit spending to stimulate a typical recovery. Milton Friedman demonstrated years ago (and most recently confirmed by Harvard’s Robert Barro) that the deficit spending multiplier is close to zero. The two schools also oppose any tax increases during a recession. One area they likely disagree is in monetary policy during a recession: Chicago economists argue that the money multiplier is significantly positive and can generate a faster recovery than doing nothing. The Austrian school is opposed to any effort to reduce interest rates below the natural rate or to artificially pump up the economy through easy money during a downturn. That can only have negative consequences down the road. AR: The first big question is why do you think that Chicago has an advantage on methodology versus the Austrians? What about the Austrian traditional criticisms? Chapter 4 of “Vienna and Chicago” deals with the debates over methodenstreit. Like most economists and, I might add, more and more Austrians, I reject the Misesian a priori view that theories can’t be confirmed or tested looking at historical data. One must always be cautious, but I found that one can learn a great about the value of a theory by looking at the evidence, and often studying history can reveal new theories that were previously overlooked. Stagflation is a case point. It was discovered in Austrian business cycle theory only after it appeared historically. I reject both the “theory only” approach of the hard-core Misesians and the “history only” approach of the hard-core institutionalists. We need both theory and history to find out the truth. I’m glad to see more empirical testing of theories in the Austrian academic journals. It’s the only way Austrian economics is going to get any attention by the profession. AR: The second big question is why do you think that Chicago has an advantage on sound money versus the Austrians? Why would a central bank system with a monetary rule be better than a free banking system? It’s a matter of practical policy. I’m willing to give free banking a try, because I have a great deal of faith in free markets, but I doubt if the public or the legislatures are willing to take such risks. Name me a country in the world who is willing to give up central banking and adopt a free-banking regime? Even Hong Kong has a central bank or monetary authority (the Hongkong Bank). A return to the classical gold standard is also unlikely at this stage. Gold is playing a more important role, but only as a reserve asset and monitoring device. I think it’s much more likely that a central bank will adopt a monetarist rule of increasing the money supply (M2) at a steady rate than adopting free banking (no reserve requirements, giving banks the right to print their own money, etc.). AR: What were those friendly debates you had with Professor Friedman? AR: In the annual meeting of the Mont Pelerin Society that took place in Guatemala in 2006 I remember you gave a lecture. At the end I was allow to ask a question, and that was, “Would you accept an end to the Fed?” I thought your answer would be, Yes, but it wasn´t. Can you explain why? I’d like to see the Fed replaced by either a computer (Friedman’s monetarist rule) or an international gold standard, or a competitive free-banking system, but it’s not likely to happen in our lifetimes. The humorist Will Rogers once said, “There have been three great inventions since the beginning of time: the fire, the wheel, and central banking.” Every developed nation has a central bank, and every developing country is adding one. Public choice economics suggests that having a monetary authority is simply too seductive and powerful to give up. Even Friedman’s simple proposal of replacing the Fed with a computer that automatically increases the money supply equal to real GDP hasn’t been adopted, because the governments want to be able to intervene at times during a crisis and inject liquidity at a faster pace than real GDP. They don’t have the faith that you and I have that capitalism will right itself and overcome these unpredictable crises. They want to maintain the power to manipulate interest rates and the supply of money and credit. They are too power hungry to give it up. They aren’t willing to accept the discipline of an international gold standard. Nor are they willing to try free banking. It’s too risky for them. So we talk all we want about what ideally we’d like to see, but it’s not likely to happen any time soon. AR: I always remember Joseph Schumpeter starting his “Capitalism, Socialism and Democracy” (1942, p. 61) with a profound insight: “What counts in any attempt at social prognosis is not the Yes or No that sums up the facts and arguments which lead up to it but those facts and arguments themselves. They contain all that is scientific in the final result.” Are we wrong if we conclude that Chicago´s arguments are not scientific? The Chicago school has definitely adopted a more pragmatic approach to economics, i.e., what works or what is predictable, as described in Friedman’s famous and controversial article on methodology. I think we need to use more logic and empirical studies to test our theories and knowledge. We can learn from both. For example, for years technical chartists used “guaranteed” formulas for making money in the stock market, but I was always skeptical of their logic. Eventually, they collapsed. AR: What about Robert Lucas, Thomas Sargent, Robert Barro and “Rational Expectations?” Why did you ignore this New Classical Economists in your history of economic thought book? I don’t think I did ignore them. I cover them in several chapters of my book, although not in any detail. See chapters 13, 15 and 17, inter alis. AR: In your “EconoPower” (Wiley & Sons, 2008), you explained “How a New Generation of Economists Is Transforming the World”. Can you make a summarize of your arguments for the reader? My main argument is that economics has moved from the “dismal science” to the “imperial” science, with economists making inroads into finance (modern portfolio theory, defined contributions plans), business (economic value added, auctions), law (capital punishment), politics (public choice and forecasting elections), history (cliometrics), environmentalism, religion, and even sports. It’s a fascinating broadening of the discipline in the past generation. I’m glad to be a part of it. “Economic Logic” is not a treatise, but a modern-day textbook. I don’t think I can improve upon Mises’s or Rothbard’s magnum opuses, although Reisman’s captivating “Capitalism” is flawed in its defense of the Ricardian cost-of-production theory of value. I wanted to create an Austrian-style “no compromise” textbook that could be integrated into mainstream economics and be adopted by the profession generally. So it is divided into micro and macro chapters, similar to other textbooks, but there are important additions — in micro, I start with the profit-and-loss income statement and Menger’s theory of the good, which business students can relate to and an important “missing link” in microeconomics. But my textbook is not so radical that it ignores standard microeconomics. By chapter six, I introduce supply and demand, cost analysis, the factors of production (land, labor, capital, and entrepreneurship), and the financial markets. My macro chapters start with the Austrian 4-stage model of the economy, integrating GDE with GDP and other national aggregate statistics. In my money and banking chapter, I introduce the history of money and the international gold standard before I discuss monetary policy. I also include the pros and cons of Keynesian economics, so students become familiar with this defective macro model, AS-AD, etc. “Economic Logic” also has a test bank, and we are working on a student manual, so it has everything a professor would want to teaching sound economics at a college level. It has been adopted by a half dozen institutions, including the business school at Universidad Francisco Marroquin, the free-market university in Guatemala. AR: The second is “The Power of Economic Thinking” (Foundation for Economic Education, 2002). How has economics invaded and transformed politics, finance, history, law, religion and other social sciences? This book is an earlier version of “EconoPower,” discussed above, a compilation of columns I wrote for “The Freeman” during the 1990s. AR: What about your “Investing in One Lesson” (Regnery Publishing, 2007). Is that book as clear as Hazlitt lessons were on economics? I have always been envious of Henry Hazlitt’s classic title, “Economics in One Lesson,” and wanted to create a similar title in finance if I could come up with the “one lesson.” I finally did in 2007 — the one lesson being “Wall Street exaggerates everything: The business of investing is not the same as investing in a business.” I explain why stocks are inherently more volatile than the underlining businesses they represent, and then in the rest of the book, I offer ways to minimize the risks of stock-market investment while increasing the chances of making money. One reason Wall Street is not the same as Main Street is based on the Austrian concept of stages of production — the stock market is a capital good further removed from final consumption. I’ve written extensively on Austrian theory of finance in “The Structure of Production,” “Economics on Trial,” “Economic Logic,” and an essay for “The Elgar Companion to Austrian Economics,” edited by Peter Boettke. I’m both an admirer and critic of Ayn Rand and her philosophy. She articulated better than any other novelist the evils of totalitarianism, interventionism, corporate welfarism, and the socialist mindset. “Atlas Shrugged” describes in wretched detail how collective “we” thinking and middle-of-the-road interventionism leads a nation down a road to serfdom. No one has written more persuasively about property rights, honest money (a gold-backed dollar), and the right of an individual to safeguard his wealth and property from the agents of coercion (“taxation is theft”). Yet her dogmatic defense of greed and selfishness hurts her cause and has created an apologetic brand of capitalism that is still viewed negatively by the general public. John Mackey, the brilliant CEO of Whole Foods Markets, offers an improved brand of “conscious” capitalism that hopefully will convert business leaders and the general public to a more positive view of free enterprise. AR: What about Peter Drucker? Is he an Austrian? Like Joseph Schumpeter, Peter Drucker grew up in Austria along with Mises and Hayek, but is considered an enfant terrible of the Austrian school. He became the world’s most celebrated management guru, and his management style was definitely Austrian, with his emphasis on economy, thrift, creative destruction, and entrepreneurship. He was critical of Keynesian economics, but was not a true believer like Mises. He thought that laissez faire capitalism was defective. But rather than endorse big government, he endorsed big business as the ideal social institution. AR: You have been the President of the Foundation for Economic Education (FEE) between 2001 and 2002. How was that experience? It was a great experience that ended too quickly. My goal was to bring back the glory days of FEE and make it a household name like Cato or Heritage. I planned a series of events, including FEE’s first national convention in Las Vegas, which attracted over 850 attendees, and a promotional campaign to increase ten fold the circulation of “The Freeman.” I also engineered the acquisition of Laissez Faire Books. Lastly, I invited America’s mayor Rudy Giuliani to speak at our annual Liberty Ball and leased the large Hilton Hotel ballroom in New York that holds more than 2000 people. But my plans were cut short when Rudy Giuliani proved to be a controversial choice, and I wasn’t especially adept at fundraising in my first year. I guess the board wanted someone who didn’t rock the boat and spent more time quietly raising money than creating new programs and expanding old ones. Alas, I lasted only a year as president. I’ve had a successful career in marketing, but I don’t think I was cut out to be a fundraiser, and I don’t envy those who have to do it every day. AR: If we take your more than 25 books and all your papers, and ask which is your most important contribution to economics and finance. What would you say? First, replace Keynes’s macro model with the universal four-stage model of the economy. This my work, “The Structure of Production;” It has application to the financial markets. Second, write an alternative one-volume history of thought to Robert Heilbroner’s “Worldly Philosophers.” This is my book “The Making of Modern Economics,” which has now gone through two editions. And third, develop a “no compromise” college-level textbook in economics that rivals Paul Samuelson’s “Economics.” “Economic Logic” seeks to integrate Austrian economics into the mainstream textbooks. Of the three, #2 has been the most successful so far. AR: Please, tell us the story behind “The Mark Skousen School of Business,” in the Grantham University. I was surprised as much as anyone when I was told in 2005 that Grantham University, an online university with headquarters in Kansas City, Missouri, was naming their business school after me. Usually you have to be a billionaire or dead to have a school named after you. They want to create a free-market brand of business, finance and management based on my free-market views, since I’ve had experience in all three fields. I have just completed a personal finance course, “Dollars and Sense,” for all the students (15,000 and growing, mainly in the US military), and will be using my “Economic Logic” textbook as the main book for their business students. I’m working closely with them to develop a new business school program for Grantham, and they have high hopes of expanding aggressively around the world. AR: We can´t finish this interview without comments on FreedomFest. Thanks for asking. FreedomFest has been a surprising success, rivaling my success as an investment newsletter writer (“Forecasts & Strategies,” which I’ve been writing since 1980). For years, I thought that the freedom movement, broadly defined, needs to gather together once a year to learn, network, socialize and celebrate liberty, or what’s left of it. But we’ve always been too individualistic, too much like a herd of cats, and we need to come together more to show and feel a unity of support. So when I was president of FEE, we had our first national convention, and it was a big success with 850 attendees. When I left FEE, I continued the idea by producing FreedomFest, “the world’s largest gathering of free minds.” We meet every July, a week after the 4th, in Las Vegas, the world’s most laissez faire city. It’s a “hot” conference, and we continue to set records every year. This year we had nearly 2400 attendees, with over 200 speakers and exhibitors. All the major think tanks and freedom organizations — Cato, Reason, Heritage, FEE, Goldwater, Adam Smith, PRI, Heartland, ISI, Eagle, etc. — come from around the world, and it’s quite an affair. Steve Forbes and John Mackey (CEO, Whole Foods Market) attend all three days every year and are now our official ambassadors. I encourage everyone from around the world to join us: www.freedomfest.com. AR: Can you conclude with some reflections or suggestions to the young students that are reading this interview? Let me say something controversial. If you want to change the world and the economics profession, learn from the great Austrians at Hillsdale, GMU, Grove City, etc., as an undergraduate, and then apply to the top ivy-league graduate schools (Harvard, Chicago, Princeton, Yale, Stanford, etc.). With your Ph.D. in hand, apply to teach at these top ivy league schools, and if you get a position, start teaching Austrian economics to the next generation of students. Don’t write academic articles for Austrian journals. Write for the top economic journals — AER, JEP, etc. That way the best and the brightest will finally know about Mises and Hayek. One of my regrets is that I got my Ph.D. at George Washington University, a second-tier graduate program. As a result, I found it difficult to teach at the top schools. I taught two years at Columbia, but that was it. When I wrote “The Making of Modern Economics,” I decided to have it published by a non-market publisher, M. E. Sharpe. It proved to be a good move, because it has exposed a large group of social democrats to Austrian and Chicago economics. Back when I got started as a student in the 1960s, there were virtually no free-market textbooks, few free-market economics departments, and only a handful of treatises and publications you could read that introduced your to market principles — Friedman, Mises, Hayek, Rothbard, Hazlitt, and the like. Now there are hundreds of professors, books, think tanks, organizations and conferences to teach free-market principles and the heroes behind the marketplace. I encourage you at attend these seminars and become involved with the various think tanks and websites. Be sure to check out several resources and think tanks in free-market economics. Every institution has its biases and its favorite writers, and sometimes even suppresses scholars they don’t like. It’s unfortunate but a fact of life in the freedom movement. I invite you to visit my website at www.mskousen.com and check out my articles and books that may advance your knowledge of free-market economics and finance. I’m also starting an Austrian-oriented business undergraduate and MBA program online at Grantham University, if you are so inclined to pursue a business degree. AR: Professor Skousen, thank you so much for your time and effort! Un placer! It was a honor, and I wish you the best of luck in your work and your interviews. And remember, A. E. I. O. U.
I am glad Ihave a chance to read these interview. Gives me a bird eye view on the Economics today. Definitely arose my interest in it. Looking forward to participate one of the FreedomFest events soon.